I want to write to you about a product I love. A product that, if you're a runner, a cyclist or do-er of other various activities out in nature, you should not be without. It's a product that you hope never has to be used for it's purpose, but one you never want to be without. That product is RoadID. Now, I will be the first to confess, I was without a RoadID for much longer than I should have been. Sure, I had seen the little free shipping flyers in the running store and in a swag bag or two (or twenty) but I always brushed it off as "That's cool. I should look into that." Then the paper would get into a pile and I'd forget about it. Then I read about it on a blog or two (or twenty) and realized "Wow, that's great. I should really get one." But then there was often a giveaway for a free one, so I'd tell myself, I'll see if I win it and if not then I'll order one. The giveaway would come and go and forgetful me would, well, forget. Or I'd remember while at work and mark it in my brain to do tonight, which would promptly be deleted later by some code problem I'd face. Noticing a pattern? Yep, it's me not getting a RoadID. It's me running without that extra bit of safety. Well, finally I did something about it. When I left for work one day, I told my wife "Honey, I'm going to go spend money on running stuff today. It'll only be like $20. 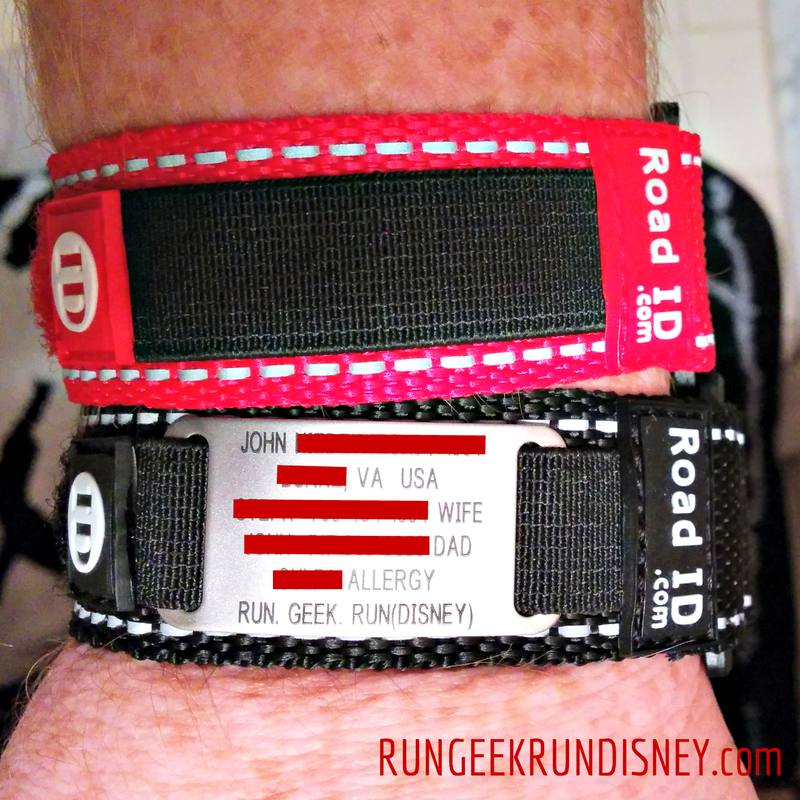 I finally going to actually buy a RoadID." I just needed to be safe. Yeah, sure I have my phone set with emergency contacts that should something happen people can call certain numbers (also good for if you should lose your phone). That only works in a not worse case scenario. I know we don't like to think about it, but that's a real possibility. If you take that kind of damage, you phone likely will as well. Then that information is lost. RoadID is great because they offer choices. They have the Elite, Slim, Sport (pictured on my freckled wrist), Shoe, Ankle, Shoe Pouch and FIXX (dog tag). You can also get a variety of colors. You see me showing off the black and red Sport bands that I purchased. The ID can be interchanged and replaced as your information changes, without having to buy a whole new set (unless you use want to use that as an excuse to pick up another color). I opted for the Sport, with it's nylon strap. It features reflective strips and velcro closure. It has been really comfortable on runs and I thought it would just be a better fit for me personally than the other styles. It's comfortable and I don't really notice it. The engraved ID is fully customizable. I got 6 lines of text that could be whatever I wanted. They offered suggestions, which I followed pretty closely. I listed my name and birth year, followed by where I was from (townwise). I chose to list 2 emergency contacts, with a name, number and relationship listed. Then I took one line to list my only medication allergy. Since I didn't have more medical information to list and I didn't feel like adding a third contact, I used my final line just to put my blog name down. Why? Because I could. You could also use for something inspirational (I almost put 'RUN STRONG' but after putting 'RUN' it became 'RUN. GEEK. RUN(DISNEY)'. We can wear all the reflective gear we want, look both ways, run on paths, but you're not invulnerable. Even if you only run on paths that never cross the road, what if you pass out? What if you slip, fall head over heals (not in love) and knock yourself out? Do you always carry your ID? Who should you call (other than Ghostbusters)? Are you allergic to any medicine? Do you have some other condition, important to medical professionals? All of this information can be contained on your RoadID. Then you can feel good knowing, should the unthinkable happen, this important information is right there. Still be careful, but RoadID has your back (or wrist). Disclaimer: I was not paid or compensated in any way for this post. I wrote it simply because I truly think everyone should have one. I also personally bought the ones in the picture. I am however now a member of their affiliate program, which just means if you click the linkies, they'll know I sent you, and if you buy, I get something back. However, I just care that you go get one. Please be safe out there. I forgot to mention the interactive one as well. I went with the standard old school one, but that looks like it could be very useful. Especially if you have more information or a changing history that is important to keep up to date. I've been running with Road ID for over a year now and love it. It's a must have for any runner that goes solo especially when it's dark.Nice post. Thanks. Yeah. It's really important to have, and I like that they keep it from costing too much, even though it can be invaluable if you need to actually use it.